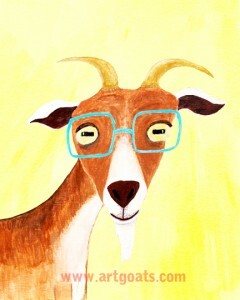 Sporty goat is sporting his retro neon flare and throw back attitude. No matter what decade he is in this athletic Nubian little buddy is ready for any sport and is down for some post fitness libations. 4″x6″ original painting on wood with a nice glossy coat. PS: the photo downplays the neon flare, in real life the fluorescent green and red are really something. Original painting will be available at the Cari Carter Show, May 31st at The Jack London Bar. 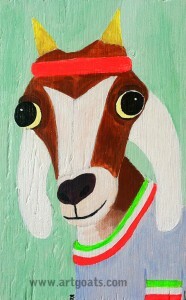 For more goat action check out Art Goats @ etsy. Just in time for Prom season, Gentleman Goat is back in his finest white suit. He is ready to take your Prom Night to the next level and catapult you to Prom Queen status. This goat knows how to party and is a true Nubian gentleman. 4″x6″ original acrylic on wood with a nice high gloss finish. A tribute to Prince, partying like it’s 1999, doves crying, raspberry berets, changing your name to symbols, and to a girl that really knew how to grind—Nikki. 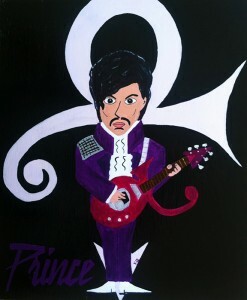 This little Prince gem will be available exclusively at the Cari Carter Show tomorrow night at The Jack London Bar. 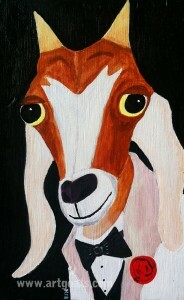 Art Goats will be at the show and I’ve heard through a inside source that Prince will be there as well. Show starts at 9pm. 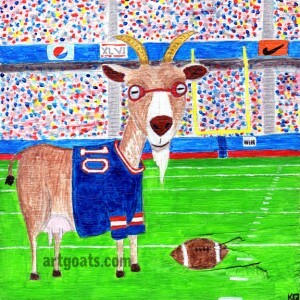 After reading about the NFL Draft and hearing that Eli Manning is hosting Saturday Night Live this week I decided to offer some limited edition prints of the notorious Super Bowl Goat of Super Bowl 46. SB Goat predicted the Giants to win 31-24. A little off, but picked the winner. An ideal gift for Giant fans and makes a nice little gem of Mother’s Day gift for those sport loving mothers. This is a inkjet archival print on 230g matte paper created from original acrylic and ink painting on recycled wood. White border for easy framing.